Many PRIZES AND MEDALS for the winners following a breakfast for all!! 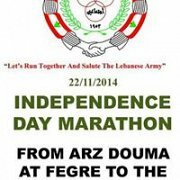 Gathering at Douma Club at 8 am. Registration fee: 5 000 L.L.